Saturday, May 28 unofficially marks “opening day” of wedding season, where more than two million couples get married and the industry nets about $72 billion every year in the United States. If you’re planning a summer wedding, Carithers Flowers offers more than just beautifully designed floral bouquets; the company has a successful event design business and prepares floral arrangements and centerpieces for everything from corporate gatherings to weddings. 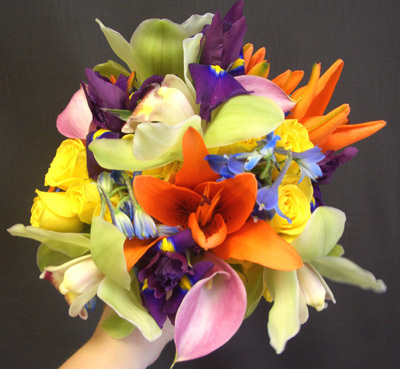 There are a wide variety of flowers in season for a summer wedding. From calla lilies to hydrangeas, roses, snapdragons, and sunflowers, Carithers Flowers talented team of wedding floral designers can help will guide you to the perfect flowers for your special day. Charles Carithers, owner of Carithers Flowers, and his team of talented designers are passionate about flowers. The team at Carithers Flowers always chooses flowers with the best quality and freshness. Whether searching for a bold, elegant design or a neutral, contemporary arrangement, you will undoubtedly be satisfied with Carithers Flowers for your wedding floral arrangement. Their commitment to personal service and award winning designs assures that they will design your wedding flowers with the details that keep your day special and unique. Voted Best Atlanta Florist, Carithers Flowers offers same-day national flower delivery. Local delivery to Acworth, Alpharetta, Atlanta, Austell, Canton, Decatur, Duluth, Dunwoody, Johns Creek, Kennesaw, Lawrenceville, Marietta, Norcross, Powder Springs, Roswell, Sandy Springs, Smyrna, Vinings, Woodstock. Call or email Carithers Flowers (404) 418-7443 or events@carithers.com to schedule a consultation and meet the design staff. Follow Carithers Flowers on Twitter to receive 10% off your next order. Become a friend on Facebook to view the latest event photos and videos from Carithers award-winning design team.